This screen is the main screen. It allows you to take sales orders and navigate throughout other sections of the program. This can be done using the ease of use keyboard. You can break down each item into sub-accounts as well. Let say, you have several children and each has a portfolio under your name, this software allows you to group them and break it down on the screen and report. In this example: Jen Alfred, Jim Alfred, and John Alfred are children/relatives of Daniel Alfred however the entire portfolio account belongs to Daniel Alfred. From these fields the Annual Earnings, Maturity Value, Current Value will be calculated. 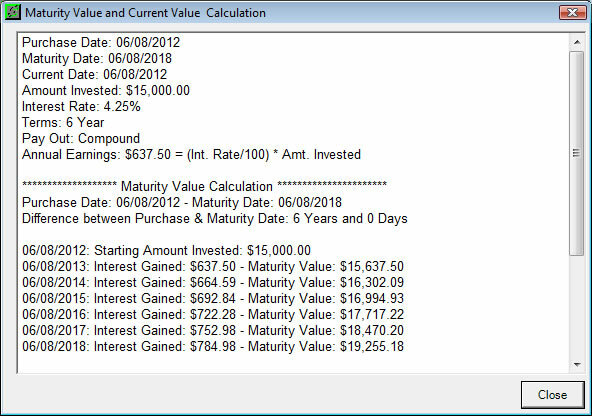 Once you enter a portfolio item and a term length and save it, click the info button to see a year by year breakdown calculation of the value of portfolio item. Very useful when clients want to know how much a particular item will be worth after a given time. This screen provides a very good self checking mechanism to verify the calculations are correct. There is nothing better than to show the math broken down for clarity. 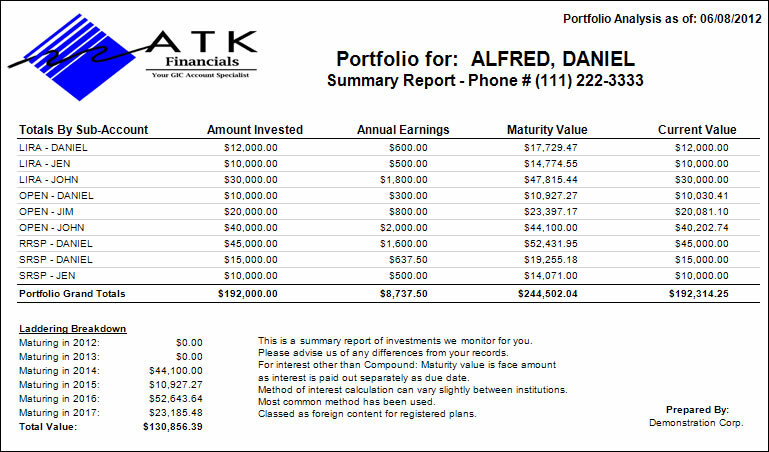 Above is a preview/print summary report for Daniel Alfred that shows all his accounts and the current value of his portfolio. It is grouped by portfolio type and sub account. There are additional page that will also show the details of each portfolio type/sub-account combination. 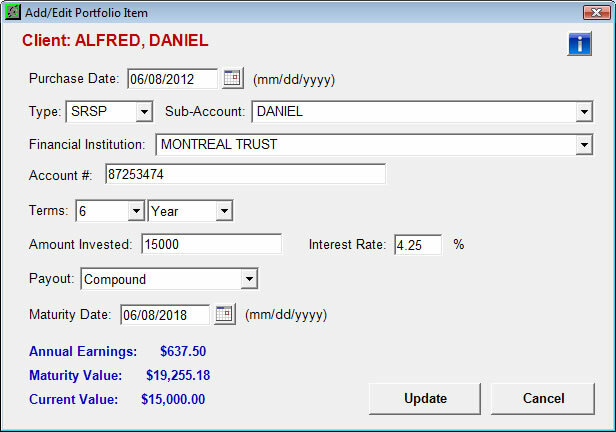 We can also provide additional software customizations to suit your needs with Portfolio Manager.